Fires rage and craters litter the Sudanese town of Abu Zabad after a Sudanese Armed Forces raid aimed at “eradicating” rebel groups in West Kordofan state. Analysis of the open-source satellite intelligence reveals evidence of government troop movements consistent with an expanding offensive against rebel groups such as the Justice and Equality Movement and the Sudan People’s Liberation Movement-North. 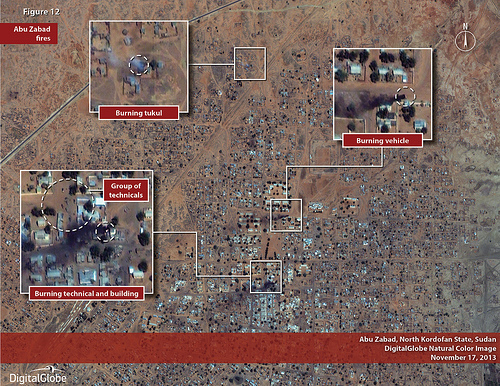 Images show Sudanese Armed Forces and military equipment – including hundreds of armoured trucks and Heavy-Lift Transporters – massing at nearby bases between late October and mid-November before the November 17 attack. At El Obeid air base, four Russian Mi-24 helicopters, three Nanchang Q-5 bombers, two Mig-29 fighter-bombers, two Antonov aircraft, one Mi-17 transport helicopter, and one Shaanxi Y-8 transport are seen organising before images show evidence of aerial bombardment around the town. The images were collected by the Satellite Sentinel Project, and show bases in the town of Dilling housing an array of artillery units, including howitzer cannons, Chinese type-59 130mm field guns, and tanks. The Satellite Sentinel Project monitors the human security situation in Sudan’s borderlands and is primarily funded by Not On Our Watch, a charity campaigning for action against mass atrocities. Sudan’s Defence Minister Abdel-Rahim Mohamed Hussein announced the launch of military operations in the region on November 11. “We will not stop until we crush the rebels,” said Hussein, who is wanted by the International Criminal Court for crimes allegedly committed in Darfur. The Sudan People’s Liberation Movement-North and the Justice and Equality Movement have been locked in a bloody conflict with the central Sudanese government surrounding the disputed Abyei region since 2010. Hostilities intensified after the division of Sudan and South Sudan, when the groups re-emphasised claims that the Khartoum government is highly repressive and discriminatory towards those in Sudan’s peripheral states. The conflict also has roots in the 2003 Darfur war, in which an estimated 300,000 people are believed to have been killed. Khartoum has banned the Sudan People’s Liberation Movement-North and Justice and Equality Movement for advocating the overthrow of the current regime. The government’s campaign against rebels in Kordofan is part of President Omar al-Bashir’s promise to “eradicate rebel groups” by 2015. In an October report the Satellite Sentinel Project, which tracks the Sudanese government’s armed forces, began to document increased military activity at state facilities in El Obeid and Kadugli, and warned there was a high risk of a renewed offensive. “The build-up of aerial assets across Sudan, particularly in El Obeid, Dilling and the surrounding environs, signals a major offensive,” the project said. On November 17, fighters with the Sudan Revolutionary Front – a group aligned with the Justice and Equality Movement – stormed Abu Zabad. The rebel group seized positions held by Sudan’s security forces and held them for several hours. Fighting between the government and rebel groups continues. On Wednesday, army colonel Alswarmy Khalid Saad confirmed to Africa Reviewthat their troops had clashed with Sudan People’s Liberation Movement-Northforces in South Kordofan. The Sudan People’s Liberation Movement-Northhas been accused by the army of attacking Kadugli, the regional capital. Local reports claim the joint Sudan People’s Liberation Movement-North rebel forces launched a counter-attack against government forces on Thursday near the Abu Zabad area. Meanwhile, during the past year, Sudan has been building up its military capabilities – especially its air power – with contracts emerging for new helicopters and fighters. The air-power build-up is also visible in Satellite Sentinel Project reports, which show an Ilyushin Il-76 airlifter at El Obeid, a large transport aircraft previously unseen in the area. “The main advantage of the new Su-24s is that they are supersonic, so do not have to be deployed as close to the action. This means they can be based at a relatively central airfield and still be able to carry out air strikes where ever needed in southern and western Sudan,” said Jeremy Binnie, a senior analyst and Middle East/Africa editor of Jane’s Defence Weekly. “There’s been a total lack of commitment to allow access for the UN vaccination campaign against polio. In fact, the troop movements begin at exactly the same time as the promises that were made, so it looks like there was no intention of allowing UN access,” she said. Polio cases have been reported in neighbouring South Sudan. This article was originally published with Al Jazeera on December 2nd 2013.